And it is architecturally quite lovely too, with a grand old station building. 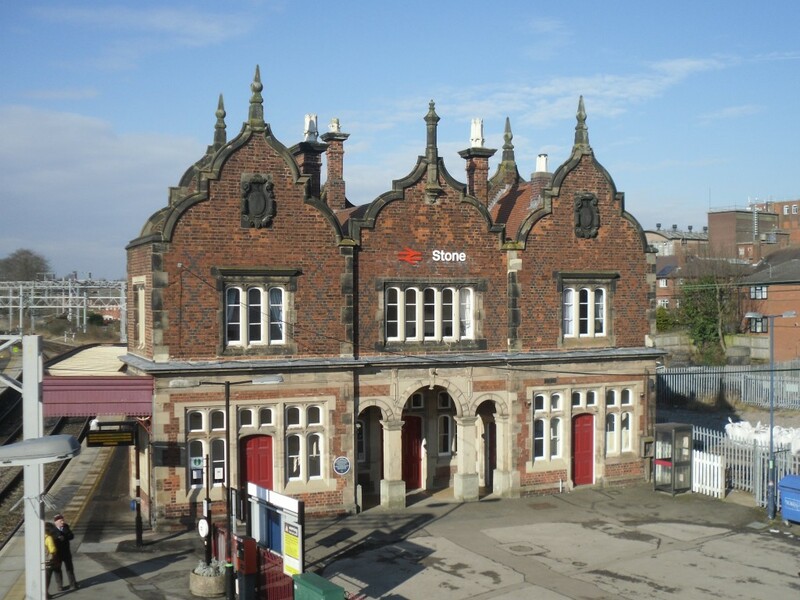 It dates back to the opening of the station on its current site in 1849 and is Grade II Listed. Sadly it is no longer in railway use, but now serves as a community centre. Having grabbed the requisite station sign shot, we found ourselves with an hour to wait until the next bus onward, so we headed to the high street. Stone is a small place with one main row of shops. Pleasingly there were relatively few chain stores and a nice selection of independent retailers. Naturally, we didn’t give our money to any of the locals, instead deciding to invade Costa Coffee. Some of us hadn’t planned ahead and brought sarnies, so they needed to buy a panini. And that was it for Stone, really. 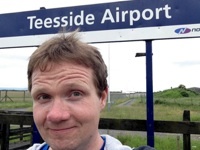 It was good to see at least one railway station that had been reprieved from the ignominy of closure-by-stealth and bustitution, although I was not happy to be leaving the place on yet another railway substitute bus. You may have noticed that I blogged about the stations in a non-chronological order. This is true – I put Stone last because I wanted this series of blog posts to finish on a positive note. Everyone likes a happy ending, right? I want to thank Scott and Ian for coming along with me on this day. They’re great company and turned what could have been a miserable day of trudging along icy footpaths into an enjoyable experience. Of course, they are both avid bloggers and have recorded their own thoughts on the day. Ian’s is here and Scott’s is here. I have to be honest, though – I was mainly there for the stations. 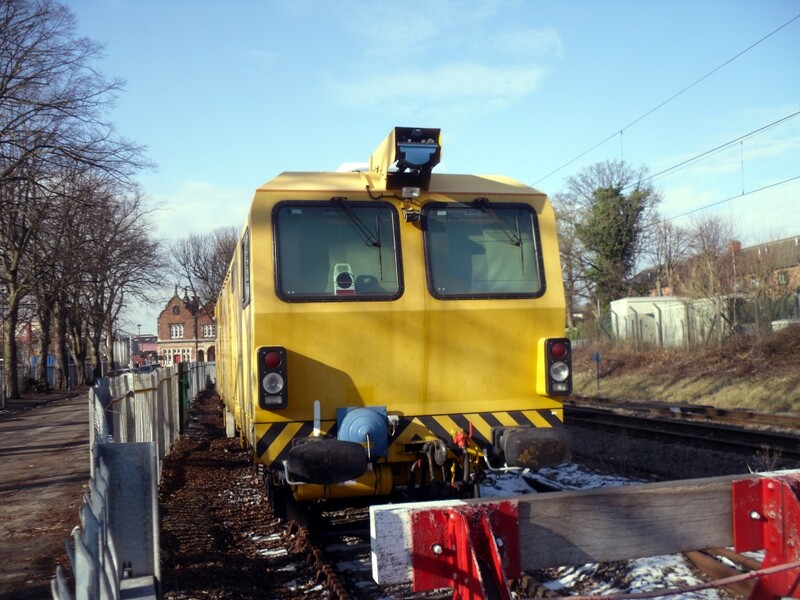 And the random bits of Network Rail engineering equipment stabled in sidings next to said stations. 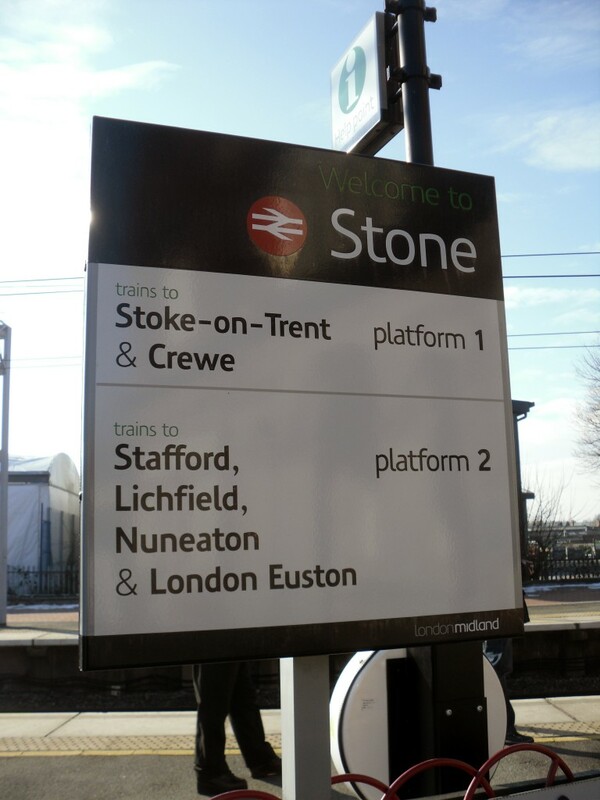 I arrived here via diamond geezer and these posts reminded me of when I was at university in Stafford in 2003 and deliberately caught the slow train to Stoke that actually stopped at all these stations one day. At the time I didn’t know the service was going to disappear so I don’t have any photos. Further entertainment was provided by the man who wanted to go to Birmingham but got on the one carriage train to Stoke by mistake. Someone told him to get off at the next station but fortunately another more sensible person told him to stay on until Stoke as there would be far more trains from there to go back the right way. Glad you have visited our area. 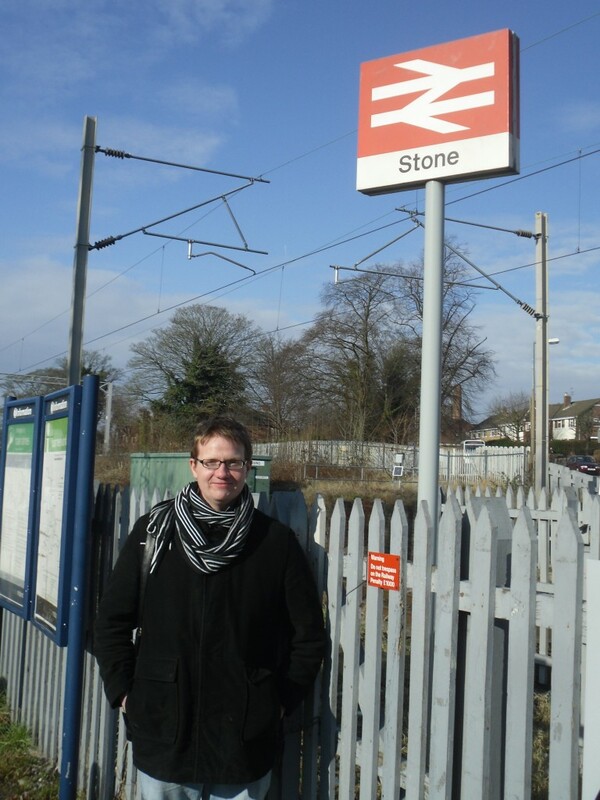 We campaigned for a long time to get trains to stop at Stone again, and numbers are still rising – though now, if it’s busy in the morning, the conductor has to work hard to catch all the students for fares before the next stop. It took a while to get the information screens installed – we had no station information for 18 months. Any suggestions about getting Barlaston reopened for trains? We have been trying. Mobilise local support: get the residents of Barlaston and surrounding areas behind your campaign. Try and get some articles in local/national press to draw attention to the station’s plight – “ghost” stations seem to fascinate journalists for some reason! Get the local MP and councillors on board. Bear in mind that London Midland run the trains, but the government, via the Department for Transport, have overall responsibility for the timetable, and so it is to the DfT and politicians that you should direct your campaign. If possible, try and gather some data to prove that stopping here regularly would be worthwhile. Value for money is the mantra at the moment so an additional stop at Barlaston would have to be justified on a cost/benefit analysis. Best of luck! Certainly Barlaston seems worthy of a service based on what I saw on my visit. 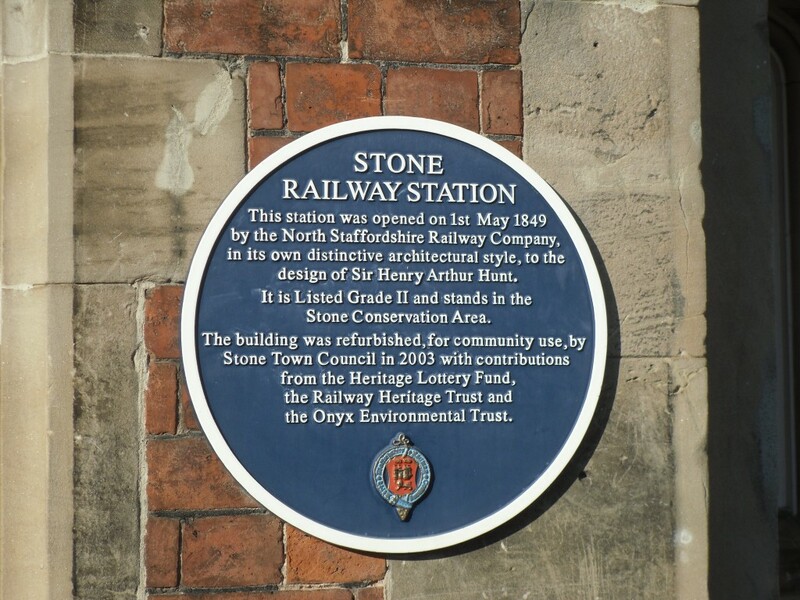 Nice pics of stone station .